Well folks, “Day of the Doctor” was excellent. And now we eagerly await the start of Peter Capaldi’s era. So, now that the 50th anniversary’s episode has aired, I’ve decided to reveal my rankings of all eleven Doctors. I await your flames. (note: This list excludes the War Doctor, because I don’t think one episode and a 7-minute short is enough to base an opinion on. But for the record, John Hurt was excellent in his portrayal. 11. Paul McGann (#8)–I’ve only seen the one movie. I haven’t listened to the audio dramas. But I am going to buy at least one or get it as a gift. 10. Patrick Troughton (#2)–I’ve only seen a handful of Troughton’s run, because that’s all that’s available. But what I’ve seen, I’ve enjoyed and I respect his contribution immensely. 9. William Hartnell (#1)–The grandpa you always wanted. That’s the first Doctor in a nutshell. I have seen quite a lot of his run and I admit Hartnell has charm. I just wish all his episodes were available. 8. Christopher Eccleston (#9)–I love the way Eccleston portrays the Doctor’s pain at all the destruction he caused and how he’s asking himself if he should even continue his mission. And then he meets Rose. 7. Colin Baker (#6)–Colin Baker’s run should’ve been so much better than it turned out. I feel so sorry for Colin. He got the dream job he always wanted, and then Michael Grade turned it into Hell. And the bad scripts brought it further down. 6. Peter Davison (#5)–Davison’s Doctor was the gentlest of the Doctors and that makes his run all the more heart-wrenching because it’s the most tragic. It contains the first on-screen death of a companion since Hartnell’s era. This era is middle of the road for me. I do enjoy Davison’s performance, but Tegan kind of ruins it for me. 5. Matt Smith (#11)–I love the energy and child-like wonder the Doctor brings to the role and he makes the show so much fun. He’s basically the Peter Pan Doctor. 4. Jon Pertwee (#3)–Pertwee’s run is so much fun! The Master, The Autons, Bessie–what’s not to like? 3. Sylvester McCoy (#7)–McCoy’s run is probably, in my opinion, the most underrated run of the entire series. It was right after the “Trial of a Time Lord” saga and got off to a bad start, but when Ace comes into the picture, it really picks up and continues on to a great end. McCoy did his best to save the show from the brink of death and in my opinion, he succeeded, even though the show was cancelled. 2. 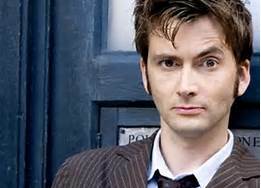 David Tennant (#10)–Tennant is just awesome! He plays the role so well and I like the fact that he’s so popular, because he clearly deserves it. He brings in so much fun to the role and the funny moments really work, and so do the tender moments. He is a Doctor who has finally broken free of his inner prison caused by the Time War and is just perfect. He’s also almost as crafty as McCoy’s Doctor. 1. Tom Baker (#1)–Tom Baker is still my Doctor. He had the longest run of all the Doctors. He brought such joy to the role. The best part is that you were never sure exactly what the Doctor was going to do. His plans were so much fun to watch and he gleefully exploited all his enemies’ weaknesses. This is a Doctor who loves to cause his enemies to underestimate him, leading to their inevitable downfall. And there you have it. I’m not sure where Capaldi will go, but not one of the Doctor’s runs were bad, so I can’t wait! As I post this, I am eagerly awaiting Peter Capaldi’s start as the 12th Doctor. Why has Doctor Who maintained popularity, despite a cancellation? I believe it’s because the premise has so much freedom. It’s also because, in my opinion, not one of the actors has done a bad job as the Doctor. So let’s conclude this with a spotlight on Matt Smith. At 31 years, Matt Smith is the youngest actor to play the Doctor (before him, it was Peter Davison). He was born in Northampton, England. He initially wanted to be a football player, but that changed when he contracted spondylosis. (this was alluded to in “The Lodger”. ) He became an actor in 2003, starring in BBC productions based on works by Phillip Pullman (of The Golden Compass fame). His first major role was in Party Animals in 2007. Russell T. Davies stepped down as show-runner and handed over the role to Steven Moffat. The show went through four different openings, with the fourth bringing back the feature of the Doctor’s face. This is the most an opening has had. Beginning with Series 6, each season was cut in half. Although Matt Smith isn’t my new #1 Doctor (he’s #5 for me), I’m sorry to see him go. I’ve enjoyed his child-like energy and the familial relationship he had with Amy, Rory, and River. With Matt Smith, River became even more interesting. We learned she has Time Lord DNA (in “A Good Man Goes to War” and “Let’s Kill Hitler”) and that her parents are Amy and Rory. She is also the Doctor’s wife and was conditioned by a conspiracy to kill the Doctor, but eventually overcame it. Amy and Rory are the only married couple we’ve ever seen in the TARDIS. For this reason, I thought it best to spotlight them simulataneously. Amy’s determination makes her an excellent character and I love how she plays the Doctor’s moral compass. Rory was the companion time could not kill, though it tried several times (it finally caught up with him in “The Angels Take Manhattan”, sadly), and he had lots of awesome moments. These three characters are not companions in the traditional sense, but they are too important to skip over. They specialize in paranormal investigation and it’s hinted that Vastra and Flint were the inspiration for Sherlock Holmes and Doctor Watson (note: Steven Moffat also controls Sherlock) and have aided him several times. Strax is my favorite of the three. Clara is “the impossible girl”. She appeared to the Doctor in three different timelines before he finally acquired her in “The Bells of St. John”. She fought the Great Intelligence (an old enemy dating back to Troughton’s era in the missing episodes “The Abominable Snowman” and “The Web of Fear”) by spreading herself out throughout the Doctor’s timeline, eventually meeting all his incarnations. This is an excellent introduction to Matt Smith’s character and the arc for series 5. This is a story that greatly imitates Classic Doctor Who while keeping things fresh. I thought the “space whale” was a neat idea. The Weeping Angels are back and even creepier than before! We also learn much more about River Song. This story reintroduces the Silurians, who haven’t been seen since “Warriors of the Deep”, during Peter Davison’s era. The Doctor meets one of my favorite painters, Vincent Van Gogh. I love the ending! 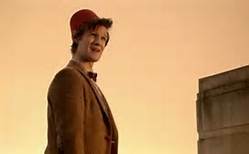 The first finale of Matt Smith’s era resolves the arc of series 5 and shows the Doctor at his most methodological. He is a true guile hero. This story introduces the Silence and answers more questions about River Song. Neil Gaiman’s first story for Doctor Who proves he has what it takes to write for the show (was there ever any doubt?). A story where Rory punches Hitler? YES, PLEASE! Verity Lambert, the first producer of Doctor Who, described the Doctor as CS Lewis meets Father Christmas. So why not an episode that pays tribute to CS Lewis? It’s my favorite Christmas episode so far. This was a great western-themed story. Clara officially joins and we get reintroduced to The Great Intelligence. I should also note that “The Web of Fear” has mostly been restored with some animation. Clara learns the responsibility of being a companion in this beautiful story. Gaiman’s second story brings in Warwick Davis of Willow and Return of the Jedi fame. It’s excellent! Please Mr. Gaiman, write more stories! I’m not bothered by the fact that two atheists have run Doctor Who since its revival because, for the most part, both have treated Christianity with an air of respect. This is a hypocritical episode and I did not enjoy it at all. I wanted to like this one because it was introducing Kate Steward, the daughter of Brigadier Lethbridge-Stewart. Although I really hope we see more of her, the story was so slowly paced that I could not really enjoy it. You can spend the rest of your life with me, but I can’t spend the rest of mine with you. I have to live on. Alone. That’s the curse of the Time Lords. With Eccleston gone, a new actor was chosen: David Tennant. Within one or two years, he became the most popular actor of the revival, almost beating Tom Baker’s status in the Classic period. Tennant was born to Essdale Helen and Rev. Alexander “Sandy” McDonald. Like Colin Baker before him, David was a lifelong fan of Doctor Who and cited it as the reason he wanted to become an actor. At sixteen, he attended the Royal Scottish Academy of Music and Drama. During this thime, he changed his last name to Tennant, inspired by Pet Shop Boys’ lead singer Neil Tennant (they’re his favorite band.) because the Equity Union already had a David McDonald. He starred in an episode of Dramarama. He joined the Dundee Repertory Theatre in the 90’s. He also became a member of the Royal Shakespeare Company. He also played Barty Crouch Jr in Harry Potter and the Goblet of FIre. His most recent role was in Nativity 2: Danger in the Manger. 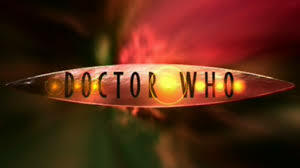 Beginning with “The Runaway Bride”, a new opening was used, complete with a slightly new logo. “School Reunion” and “Doomsday” both started spinoffs. “School Reunion” started the Sarah Jane Adventures and “Doomsday” started Torchwood. Four of the Doctor’s adventures were solo, for the first time since Tom Baker’s “The Deadly Assassin”. David Tennant is my favorite revival era Doctor. He is the most romantic of the Doctors, and that doesn’t bother me in the slightest. He was a fun character anda welcome change from Eccleston’s depressed attitude. He was very energetic. While he didn’t beat Tom Baker in my favorite Doctor rankings, I still think he was a great choice and I was sorry to see him go. With the Tenth Doctor, Mickey finally got the respect he deserved. He was far from Mickey the Idiot anymore. I thought this was a great change. Despite only appearing twice in the main show, Harkness continued to be busy, thanks to Torchwood. His relationship with the Tenth Doctor was a bit softened, and they seemed to be better friends. Martha is a wonderful and pretty companion. I loved her relationship with the Doctor and the sense of wonder she expressed. She is also the only character from the main show to appear in Torchwood, besides John Harkness of course. I loved Donna! She was so much fun and was the shot in the arm the Doctor desperately needed. I loved how she freely spoke her mind when she objected to what the Doctor was doing,which seemed like every story. Ah, the enigmatic River Song. What a confusing, but enjoyable, character you are. I think I should really hold off until next time for her. The Doctor learns just how terrible time travel can be in what I think is one of the saddest stories ever. How could I not like this story? It brought back Sarah Jane! It was great to see her again, and her spinoff series is excellent, especially for a kids show. Why Netflix doesn’t have it is beyond my understanding. Doctor vs. the devil? Yes, please! A story about a little girl who can trap people in her drawings. Very weird, but I enjoyed it. The Doctor and Martha meet William Shakespeare himself! This was a real treat for a Shakespeare buff like me. The first appearance of the Weeping Angels. Moffatt at his best! While I still think Roger Delgado was the best Master, John Simm certainly was great in this version. Any time you see the Ood, expect a great story. This was a great commentary on humanity’s tendency towards exploitation. As an Agatha Christie fan, this was a real treat for me. The Doctor meeting another one of my favorite writers. Now all we need is one where he meets Tolkien. The Vashta Narada need to make a comeback. They are too scary for just one story. It was about time Davros showed up in the revival. Bringing back all the companions meant the TARDIS was rather crowded (in fact, this story sets the record for most companions), but thankfully, the story gave them enough time. Ever wonder why the Doctor doesn’t want to mess with fixed points? This episode gives a very good reason: because it gets worse. What a disgusting story! The Absorbalon is a terrible master. And the ending: no, just no. Note to anyone writing a Doctor Who episode: The Daleks do not need lackeys. It never works. I really wanted to like this episode. An outer space version of the Titanic actually sounded interesting. But there were so many problems and the climax just wasn’t very satisfying. Note: There was no regeneration from Eighth Doctor to Ninth, so I linked his first scene instead. Oh, I did it again; I picked another stupid ape! I should’ve known. It’s not about showing you the universe, it never is. It’s about the universe doing something for you! Now I can talk the revived, modern version of Doctor Who, right? Yes, but first there’s a few more “wilderness years” to cover. So I’ll adopt a timeline format. 1999–BBC airs the Comedy Relief charity special “Curse of the Fatal Death”, featuring Rowan Atkinson (of Mr. Bean fame), Richard E. Grant, Jim Broadbent, Hugh Grant, and Joanna Lumley, as the Doctor. This is a spoof, so it’s not considered canon. I highly recommend watching this. It’s on Youtube, so go check it out. You will laugh, guaranteed. 2001–“Death Comes to Time”, an audio drama featuring the Seventh Doctor and Ace airs on BBCi, the Internet version of the BBC. 2003–an animated version of “Shada” airs on BBCi, this time featuring the Eighth Doctor and the second Romana. Also on November 13, the BBCi aired the 40th anniversary special “Scream of the Shalka”, featuring Richard E. Grant as the unofficial “ninth Doctor (for this reason, he is often called the “Shalka Doctor”) and Derek Jacobi as The Master, a role he would later reprise in the episode “Utopia”. In 2004, Russel T. Davies began work on the return of Doctor Who, coming off the success of his controversial program Queer As Folk. He brought on Mark Gatiss, Paul Cornell, and Rob Shearman as writers, all of whom had written either Doctor Who novels and/or audio plays for Big Finish. He also brought on Stephen Moffatt, writer of “Curse of the Fatal Death”. The first episodes aired the next year. Christopher is the youngest of three sons and was born in Lancashire, England. At the age of 19, he was inspired to become an actor. His first role was in Let Him Have It. His first TV roles were in Inspector Morse, Cracker, and Poirot. Also, prior to Doctor Who, he starred in Gone in 60 Seconds and 28 Days Later. When Eccleston starred on Doctor Who, he became the first actor playing the role who was born after the series began. According to Davies, Eccleston’s contract only lasted for one season because it was uncertain if the revival would be successful. He played Destro in the first GIJoe movie, Rise of the Cobra. He will play Malekith in the upcoming Thor: The Dark World. The show’s episodes were no longer serialized, although some stories do take more than one episode. The show’s episodes now run for 45 minutes. Davies introduced the concept of the Time War to explain the Eighth Doctor’s off-screen regeneration. Very little of the Time War is known, but is understood that the Doctor is now the last of his kind. Eccleston’s tenure ranks the lowest for me, more for it being so short than anything else. I enjoyed his moody portrayal, which seemed to be the result of PTSD. His relationship with Rose really helped her become one of my all-time favorite companions. It was a great foundation for the revival. I really don’t get all the Rose Tyler hate, she’s received in recent years. I think she was a fine companion, giving the Doctor a reason to love again. She was kind, feisty, and had the sense of wonder I think was in all the best companions. The show works best when the Doctor is in a mentor role, as he was with companions like Jo, Sarah Jane, and Ace. Rose was a fine companion, despite her flaws. Mickey was an excellent character, especially for comic relief. I feel that his initial status as supporting character helped him to prove himself as an ally to the Doctor. He was a great source of tension for the Doctor and I enjoyed his character a lot. Adam was a first for the show: the first bad companion. “wait, what about Vislor Turlough?”, you say? Well, I don’t think he was that bad a companion. Yes, he was self-serving, but he was still loyal to the Doctor. Adam left Rose to die with a Dalek in his first episode. That she survived is irrelevant. And he had the audacity to blame the Doctor when he caught him trying to send information from the future to his own time. He deserves that hole in his head. Harkness is another first: the first bisexual companion. You would think because I’m a Christian, I would have a problem with this character. However, Harkness’s nobility is enough to make me overlook this. His charming personality makes him a great character. “Rose”– This is how you start a show. Give the faithful continuity nods to show that their loyalty is appreciated and give the newbies a foundation so that they don’t have to watch the Classic version (but they still totally should). “Father’s Day”–A great story about why the Doctor tries his best not to mess with time, even if it seems like an innocent mistake. I did like this story at first. But then Sarah Jane Adventures began using the Slitheen as recurring villains. It’s hard to be intimidating if a normal woman, some meddling kids, and a robot dog can defeat you as easily as that cast did every time. 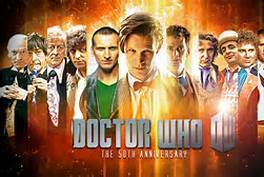 The period between 1989 and 2005 is often dubbed by Whovians as the Wilderness Years. During this time, other media such as Big Finish were still producing Doctor Who material, even though the BBC wasn’t. Then, in the mid-90’s, hope seemed to arrive. 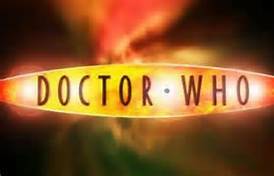 Philip David Segal, a television producer working with Steven Spielberg’s Amblin Entertainment, proposed an American version of Doctor Who. His credits included Seaquest DSV (one of my all-time favorite shows!) and Young Indiana Jones Chronicles. 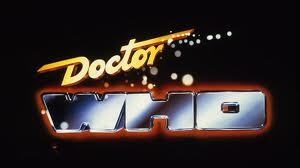 The movie aired in 1996 on Fox and starred Paul McGann as the new Doctor. Sadly, the pilot failed. 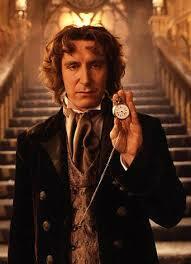 Paul McGann was born in 1959 in Kensington, Liverpool and was the third of six children. He was encouraged to be an actor by his parents. In fact, all three of his brothers are actors. He starred with all three of his brothers in the 1995 serial The Hanging Gale. Prior to Doctor Who, his biggest claim to fame was his role as Percy Toplis in The Monocoled Mutineer. After the failed pilot, he starred as David Talbot in the film version of Anne Rice’s Queen of the Damned. His most current role was in Waking the Dead in 2011. While I do think the Doctor Who TV movie is good, there are a few flaws I want to address. First, there’s the demise of the Seventh Doctor. I think it happened too quickly and too early, and did not involve the heroism of most of the past regenerations and those afterward. (excluding the Sixth’s of course) Remember, Doctor Who would be reaching a new audience as well as the faithful in the BBC. It was not as well-known a property in America as it is now. It needed to accommodate to new viewers as well as old, and I think this impeded that. Then there’s Eric Roberts. He seems more like Arnold Schwarzenegger’s Terminator than the Master. This is not what the Master is about–he is supposed to be a crafty schemer, the Doctor’s equal. And he’s also given new abilities that are thankfully discarded in later versions. He can now spit and hypnotize people, and turns into a crude CGI cobra. Time Lords do NOT shape-shift. And of course, there’s the “half-human” revelation. This completely ruins years of continuity. Fortunately, when Big Finish did audio plays featuring the Eighth Doctor, they glossed over this scene to keep it in the already established canon. 2: When we see the TARDIS interior, we see that the Eighth Doctor has a Sonic Screwdriver. Granted, he never uses it, but this is enough for me. 3: The Doctor gives a jelly baby to a policeman, just like the Fourth Doctor would do. Fortunately, the TV movie has finally arrived on DVD. I recommend picking it up if you’re curious about Paul McGann’s sole TV appearance as the Eighth Doctor. Colin Baker was sadly the first Doctor to be fired. He was offered to come back to pass the torch on, but refused because he was understandably bitter about the whole affair. And who was it passed to? 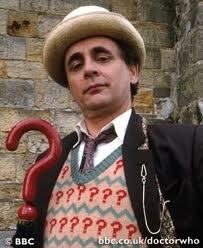 Sylvester McCoy, who would become the final doctor of the Classic period. Sylvester’s real name is Percy James Patrick Kent-Smith and is of Irish decent. He got his stage name while working on the Ken Campbell Roadshow. It was a character he portrayed; when a reviewer mistook the joke in the show’s credits for a real person, the name stuck. In 1979, he had a role with Laurence Olivier in Dracula. He was mostly a stage actor prior to and after Doctor Who. After Doctor Who, McCoy appeared in the BBC Radio 4 series Cabaret of Dr. Caligari. He appeared as the Sheriff of Nottingham in a Robin Hood musical. He worked with the Royal Shakespeare COmpany, where he played alongside Ian McKellan (Gandalf in Lord of the Rings) in King Lear in 2007. He is currently starring in Peter Jackson’s trilogy of Hobbit movies as Radagast. The final opening is not one of my favorites. While I like the logo and the impressive animation for its time, I don’t much care for the theme’s arrangement. In season 25, Andrew Cartmel became the show’s final script editor. He proposed to take the show in a darker direction and give hints to the Doctor’s origins. Sylvester McCoy was my second-favorite Doctor until David Tennant assumed the role (now he’s my third-favorite). The Doctor’s start as a bumbler didn’t appeal to me, but the darker path under Cartmel certainly did. This Doctor was a brilliant planner, strategizing much like a chess player and wasn’t above using people as pawns if necessary. It’s a shame we didn’t get to see the full scope of Cartmel’s plans. I HATE Mel! She’s not pretty in my opinion. She’s annoyingly condescending and utterly useless. And her voice is the worst. I don’t think there is any companion I could hate more, except maybe Dodo. This is Mel’s final story, and it’s great to see her go. We also see an appearance of Sabalom Glitz, who was last seen in “Trial of a Time Lord”. The whole story is great, and we even see hints of the darker direction that would come in the following season. The Doctor goes back to the day it all began and finds himself in the middle of a Dalek civil war. It’s also the first time we see a floating Dalek! Oh, and Ace gets her best moment in the show: destroying Daleks with a baseball bat and a rocket launcher. Aw yeah. The Doctor becomes an unwilling participant in an intergalactic circus where he must entertain the gods or die. The story was meant as a criticism of the fans who were becoming more and more disinterested in the show. This is the final story to feature The Brigadier and takes us back to Arthurian England. It’s really sad that we didn’t get to see more from the Brigadier, even in the modern version (but at least he appeared in an episode of The Sarah Jane Adventures. One of my favorites! The Doctor and Ace go to a haunted house she visited as a child. The story was a victim of meddling, but it’s still well-written, albeit confusing. I might as well include the final Classic Doctor Who story. It includes an excellent performance by Anthony Ainley, proving that yes, with the right script, he can be a great villain. This is the first story to feature the Seventh Doctor, and sadly it’s one of the clumsiest episodes of the show. During the filming of “The Five Doctors”, Patrick Troughton advised Peter Davison not the play the Doctor for more than four years to avoid being typecast. Davison took his advice and left before the end of his final season (he is the second Doctor to do so). 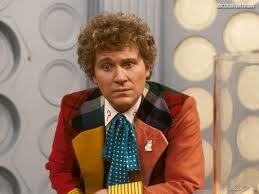 Colin Baker stepped in and was initially ecstatic. If he only knew what was in store. Colin Baker was a huge fan of Doctor Who practically from the beginning and grew up with the show. In fact, like David Tennant, it was the sole reason he became an actor. He starred in an episode of Blake’s Seven, a cult BBC sci-fi program created by Terry Nation, who also created the Daleks for Doctor Who. He is the only Doctor so far to have previously acted on the show. (this has happened with companions. For instance, both Nicholas Courtney and Karen Gillan had small roles in stories before landing their most famous roles as the Brigadier and Amy Pond, respectfully) Ironically, Colin had wanted to beat Tom Baker’s seven-year span as the Doctor. After Doctor Who, Colin spent most of his career in stage productions, such as HMS Pinafore and Woman in White. He returned to his role as the Sixth Doctor for many Big Finish productions, and I’ve heard his audio plays are better than his TV version. He also appeared as the character in an episode of the BBC racing program Top Gear. Since 1995, he has written a weekly column for the Bucks Free Press. He is the current president of the Doctor Who Appreciation Society. Colin Baker is the first Doctor to have a line after the previous Doctor’s regeneration. This did not happen again until the modern version of the show. The show had two openings during Colin’s era. The first is similar to Peter Davison’s, but with a new logo (which is actually similar to the previous logo, just colored purple and slightly bent in the middle). 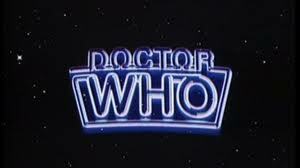 For Colin Baker’s final season, a new theme and opening was created, but the logo remained. Beginning with this era, only fourteen episodes were produced for each season. For part of Colin Baker’s first season, some episodes were actually 45 minutes long, just like the modern version of the show. (but still done in a serial format) However, for the final season of the era, the episodes were returned to their original 25-minute length. I really feel sorry for Colin. His era was plagued by terrible writing and backstage politics. There was actually an 18-month hiatus between his first full season and his last season. The reason? Michael Grade, the head of the BBC at the time, hated science fiction, especially Doctor Who. He felt the show was too violent and a drain on the company budget. During the hiatus, the cast of Doctor Who formed an organization called Who Cares and began a campaign to bring the show back sooner. Part of the campaign was a song called “Doctor in Distress.” (It was the 80’s. This was done a lot. Surely you’ve heard of “We Are the World”, “Sun City”, and “Do They Know It’s Christmas”?) There’s a big reason this was a bad idea. Unlike the songs I mentioned, none of the people behind “Doctor in Distress” could either sing or write a song. Want to hear just how bad it was? Click the link below. As for Colin’s performance, I don’t think it was bad. He was a great smug Doctor and in my opinion, he wasn’t annoyingly so. Oh, and for the record, I like the outfit. Peri goes back and forth between decent and bad as a companion, depending on the episode’s overall strength. She’s not the worst companion, but she’s not the best either, in my opinion. I hear she’s slightly better in the audio plays. I’d rather wait til next time to discuss this companion, as I feel she is better associated with the 7th Doctor. She only has two stories with the Sixth Doctor. This story introduces Sil, who earns the award for Most Disgusting Doctor Who Villain. Just listen to that laugh. What I think makes him even creepier is that you know this is an actual person in the outfit. This is something I think is lost today, not just in Doctor Who. CGI has replaced the days of Ray Harryhausen. I’m not saying we should go back to mechanical monsters, but sometimes they seem better than the CGI ones we have today. This story introduces the Rani, a rogue Time Lady who appears in two more stories; “Time and The Rani” and the awful “Dimensions in Time” special. Kate O’Mara is excellent as this character. It’s a shame she only had one good story. “Trial of a Time Lord” is a unique story. It’s really four stories linked together: “The Mysterious Planet” (parts 1-4), “Mindwarp” (parts 5-8), “Terror of the Vervoids” (parts 9-12) and “The Ultimate Foe” (parts 13 and 14). The story uses the unreliable narrator formula, most famously used in Edgar Allan Poe’s classic short story “The Tell-Tale Heart”. It’s not the most celebrated Doctor Who story, but it deserves a look. I’m really hoping Stephen Moffat refers to it when the 12th Doctor Who era commences, because there’s a prediction in the plot. “The Twin Dilemma” is almost universally considered the worst Doctor Who story ever. The biggest complaint comes from the scene where the Doctor actually strangles Peri. It also has a terrible plot and pacing. This is in my opinion the worst Dalek story of the Classic period. It seems like an incoherent mess that is paced haphazardly. The interaction between the Doctor and Peri isn’t at its best, as it is in “Attack of the Cybermen” or “Vengeance on Varos”. Davros doesn’t seem as menacing as he should be, either.